Hands up if you have ever worried about getting Alzheimer’s. You cannot do anything about getting older every day, but you can seriously reduce your risk factors for all forms of dementia. In the last few years, good clinical research shows that lifestyle changes can slow or even reverse declines in memory and thinking due to aging and the onset of dementia. Like many of you, I fit into the baby boomer generation. The youngest of us will be 54 this year and we are probably already noticing some signs of aging. Some of us even have friends and relatives who are showing signs of, or who are already diagnosed with, dementia, a term that describes a group of symptoms associated with a decline in memory or other thinking skills severe enough to reduce a person’s ability to perform everyday activities. Alzheimer’s disease accounts for 60-80% of dementia cases. Vascular dementia, which occurs after a stroke, is the second most common dementia type. But there are many other conditions that can cause symptoms of dementia, including some that are reversible, such as thyroid problems, vitamin deficiencies, and poor choices in how you live your life. I prefer to make some extra efforts now to keep my brain and body in good shape so that I can have an enjoyable and rewarding life during my 70’s, 80’s and 90’s. The good news is that the 6 key areas where you can reduce your risks will also give you a healthier and happier life right now. I invite you to join me over this next year while we explore and implement some changes in our lives to give ourselves every opportunity to outsmart dementia. This crucial for your healthy heart, blood circulation, bone density, maintaining the elasticity in your muscles and skin, reducing aches and pain, and improving your sleep. See Build and Condition Your Brain and watch 23 and 1/2 hours per day by Dr. Mike Evans on YouTube. Most of us need 7-8 hours of deep, uninterrupted sleep at night. A few of us (about 6%) can stay healthy with less, and a very few of us need more than 8 hours on a regular basis. You may believe that you are fine with less sleep, but carefully controlled research shows that the more sleep deprived we are, the less likely we are to notice the effects. With our amazing brains, we can often talk ourselves into beliefs and activities which actually harm our brains. We may be hard-wired to underestimate our sleep loss. For more information, see my article Sleep, Chief Nourisher in Life’s Feast. Our brains and bodies were evolved to survive living outside in close relationships with our tribe. During those early years, our stress saved our lives, making us run from predators and enabling us to take down prey. Today, human beings are turning on the same life-saving physical reaction to cope with 30-year mortgages, $2 gasoline, final exams, difficult bosses and even traffic jams – we can’t seem to turn it off. So, we’re constantly marinating our brains in corrosive hormones triggered by the stress response. Groundbreaking research reveals surprising facts about the impact of stress on our bodies: how it can shrink our brains, add fat to our bellies, and even unravel our chromosomes. Understanding how stress works can help us figure out ways to combat it and mitigate negative impacts on our health. Canada’s 2019 Food Guide makes a lot of sense. Eat a variety of healthy foods each day, including plenty of vegetables and fruits, whole grain foods and some protein. Make water your drink of choice. The image used shows half a plate of food with vegetables and fruits (broccoli, carrots, blueberries, strawberries, green and yellow bell peppers, apples, red cabbage, spinach, tomatoes, potatoes, and green peas); one quarter of the plate has protein foods (lean meat, chicken, variety of nuts and seeds, lentils, eggs, tofu, yogurt, fish, beans), and one quarter of the plate has whole grain foods (whole-grain bread, whole-grain pasta, wild rice, red quinoa, brown rice). The Nun Study by Dr. DavId A. Snowdon showed that having a good education and continuing to learn throughout life could, in some cases, protect people from showing the symptoms of dementia while alive, even though after death it was shown that their brains had the typical plaques and tangles of Alzheimer’s. Continuing to challenge your brain into learning something new can be done a number of ways. Computer games, hand-eye coordination sports, learning a new language, taking dancing lessons, doing puzzles, playing board games, improving your skills with musical instruments, learning to draw, paint, or sculpt, becoming a tutor, or volunteering to cook or help with a craft are all ways to keep your brain healthy and your life interesting. We humans are social, tribal people who are much happier and healthier when we are involved with a rich, rewarding, and supportive social network. Frequent interaction with others stimulates our brains, increasing our cognitive reserve. We can improve our connections with family and broaden our friendships while we exercise, while we cope with stress, while we eat, and while we learn. 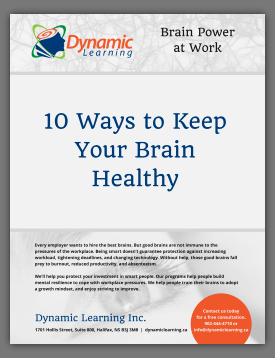 Over the next few months, I will expand on each of the above six steps in order to offer you interesting ways to protect yourself from dementia while stimulating your brain and keeping your body really healthy.